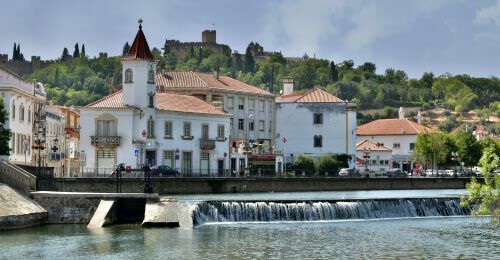 Tomar is an intriguing and fascinating Portuguese town, which should be included in any tour of centre Portugal. Today it maybe a charming and quaint town but during the 13th century Tomar was one of the most influential towns of the Iberian Peninsula, being the religious centre for the Knights Templar. This secretive and powerful religious order once ruled from the Convento de Cristo, and this expansive religious complex is regarded as one of Portugal’s finest national monuments. The town of Tomar is very scenic; set along the banks of the Nabão River and filled with ancient churches, pretty cobbled streets and traditional houses. 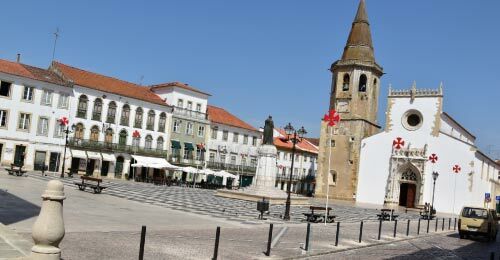 There is a lot to see in Tomar and the town makes for a great destination as part of a tour of central Portugal. 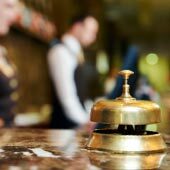 This guide will provide an introduction to Tomar and provide links to further in-depth information. 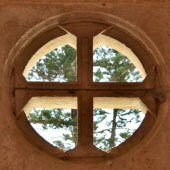 The ancient Convento de Cristo which is part castle, part convent and is steeped in a mysterious history. 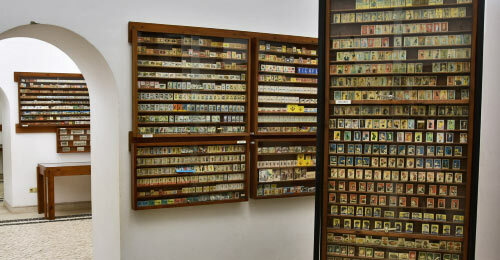 The quirky Museu Dos Fosforos, which exhibits the world’s largest collection of match boxes…..
Tomar is a great destination for independent and inquisitive visitors who wish to discover an important historical town that was pivotal in the formation of early Portugal. There are many interesting historical monuments but the majority of them are of a religious nature. 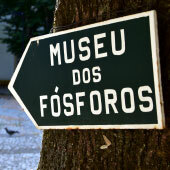 Tomar is more suited for the mature visitor, who has an interest in either history or Portuguese culture, it is not really designed for families or children as there is not much for them to do. Tomar has a very low key nightlife, which is centred around the restaurants and long evening meals. 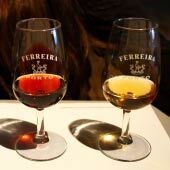 Tomar is highly recommended for visitors who are touring central Portal or traveling between Lisbon and Porto (a popular route is Lisbon, Tomar, Coimbra, Porto). Tomar can be visited as a day trip from Lisbon, as there is a direct train service but is a very long day due to the 2-hour train journey. Why stay longer in Tomar? All of the sights of Tomar can be seen within one day but an extended stay would allow time to visit the beautiful Almourol castle. 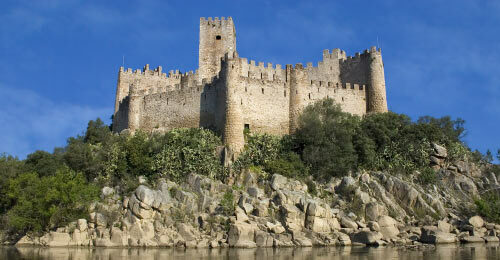 This mediaeval castle stands on the banks of the Rio Tajo and is one of the most scenic castles of Portugal. Almourol was used by the Knights Templar as a strong hold on the frontier between the Christians and the North African Moors. 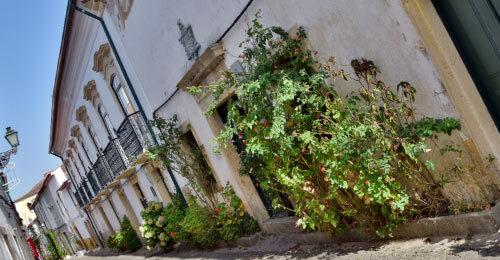 Tomar has a pleasant relaxed ambience and is the perfect destination to unwind and absorb the Portuguese way of life. Tomar makes for an enjoyable day trip from Lisbon. 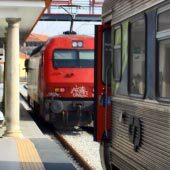 The town is connected to Lisbon by a reliable and inexpensive train service and the frequency of the services means that it can be visited in a day. There are sufficient historical monuments and attractions to fill a day of sightseeing but the town is small enough to be able to explore on foot. 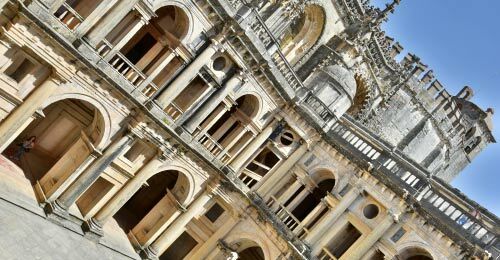 A day trip to Tomar from Lisbon will be a very long day as the train journey takes around 2 hours and certain visitors may wish to spend one night in Tomar. What’s the best Sight in Tomar? The unique circular Charola church is at the heart of the Convento de Cristo and is the finest monument in Tomar. The church was constructed in a circular design that follows the design of the great temples in Jerusalem and the interior is decorated with some of the most elaborate and intricate 16th century religious art found in Portugal. For a guide to the sigths of Tomar please click here. Why is Tomar connected to the Knight Templar? Tomar was established as the religious centre Kinghts Templar by the Grand Master Gualdim Pais in 1160. The lands of Tomar were gifted to Gualdim Pais for his religious order services during the Battle of Ourique in which the Christian crusaders defeated the North African Moors. This close association of the Knights Templar with the Portuguese monarchy allowed the establishment of the Order of Christ after Pope Clement V disbanded the Knights Templar in 1312. It is widely believed that the Order of Christ provided the knowledge and funding that began the “Portuguese Age of Discovery” in which Portuguese explorers crossed the oceans. 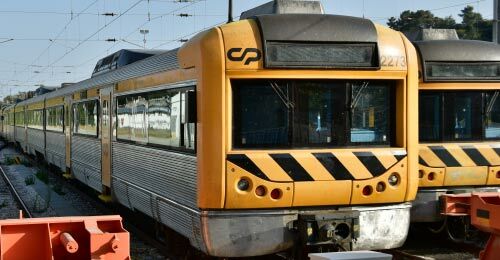 There is a direct train from Lisbon to Tomar which takes 2 hours. The train departs from Orient train station (on the red metro line) and a return ticket costs €9.95. For a complete guide to traveling between Tomar and Lisbon please click here. 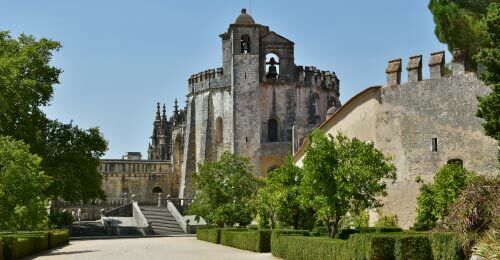 When Tomar is included as part of a tour of central Portugal it is often combined with Fatima or Coimbra. There are numerous bus services from Tomar to Fatima but the train is needed to travel to Coimbra as there are no direct bus services. Tomar bus station and train station are next to each other and are on the south side of the city. Tomar has a very relaxed nightlife scene and is more geared to long evening meals in one of the many family run restaurants. Which is the best day trip from Lisbon? Sintra is regarded as the best day trip from Lisbon, while for the second day trip the pretty port of Cascais is recommended. 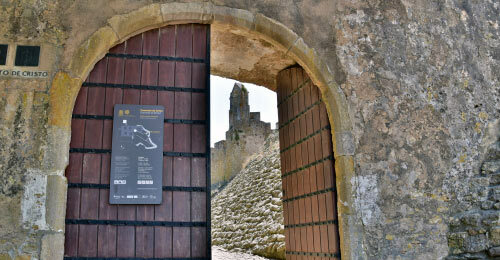 The third day trip should visit a historic Portuguese town and there are three suitable options Tomar, Obidos or Evora. Evora is the ancient capital of the Alentejo region and is the largest city of the three historic day trips but is the furthest from Lisbon. Obidos is a delightful walled town and is the most charming of the three but is small and can be fully seen in less than two hours. 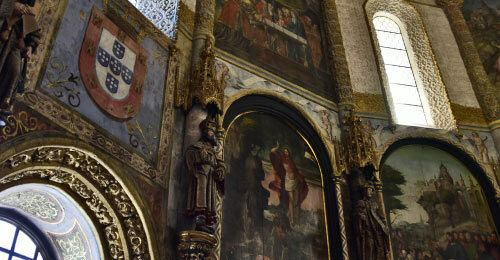 Tomar is the most historically important of the three and is again a long train journey for a day trip. for a 1 week holiday? Historic, lively and virtually undiscovered, visit Porto! What are the main tourist attractions of Tomar?